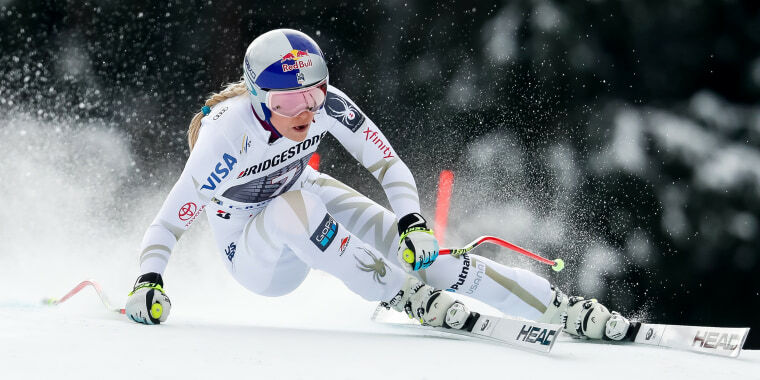 Lindsey Vonn is an Olympic gold medalist and an American World Cup-winning alpine ski racer on Team USA. As a spokesperson for Bounty, the 33-year-old spoke to TODAY Style about why she loves her strong quads and what she wishes she could tell her younger self. The body part she loves most shouldn't surprise you. "I love my quads because they’re strong and they allow me to do what I love to do." Grabbing the gold in 2010 is up there with her greatest memories, for more reasons than one. "My favorite outfit I’ve ever worn is when I won the Olympics and it was a race suit. It wasn’t very warm but it was very patriotic." Just like us, she looks to celebrities for style inspiration. "I would describe my style ... as a Rihanna-Jennifer Aniston combination." She has great taste in music, too! "My favorite song to sing in the shower is 'Sorry, Not Sorry' by Demi Lovato." She has the kind of personality that we all want to be friends with. "My emoji would be the dancing, red dress blonde girl." We're totally copying her morning routine. "One small thing I do in the morning to wake me up is put cold water all over my face. Splash it around. Wake me up." "To my younger self, I would say keep working hard and everything will turn out the way it’s supposed to." She wants you to be reminded that skiing aside, she's a person, too. "The question I wish people would ask me is, 'How are you doing?' not how am I skiing, or how am I feeling, but how am I doing in life as a person."